Stacy wrote the following article for the May 2017 edition of the Arizona Physician Magazine. 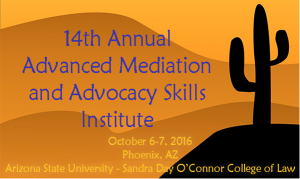 On October 6, 2016, Stacy will be on the faculty for the ABA Section of Dispute Resolution’s 14th Annual Advanced Mediation and Advocacy Skills Institute. She will speak on a panel on the topic of mediation preparation techniques. You can CLICK HERE to lean more about the event. Mediation Success: What Does it Take? On April 10, 2014, Stacy was on a panel of plaintiff and defense employment attorneys discussing the formula for a successful mediation. The speaking engagement was sponsored by the State Bar of Arizona CLE program. On October 27, 2014, Stacy was a co-presenter with Mary Jo O’Neill, Regional Attorney for the EEOC, in a seminar sponsored by the Arizona State Bar regarding the EEOC’s new Enforcement Guidance on Pregnancy and Related Conditions.